The deck’s name had me puzzled for a while. It looks French but makes no sense in that language. Then I checked out the creator’s website — Aux Arcs in French is pronounced Ozark, the mountains where the artist lives. The deck creator, Lori LaPage, says this deck is not a Tarot de Marseille and it doesn’t read like one. But I respectfully disagree. The imagery is solid TdM rendered in acrylic washes and lively black lines that perfectly capture the energy of each card. 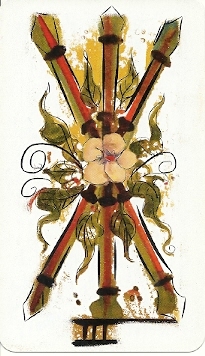 The higher-numbered swords cards look heavy and sinister, while the cups are in a party mood with their flowers and ribbons. The batons burst with vitality. Every card sings with energy, making it easy to interpret. The backs radiate the same high energy with gold starbursts on deep red. One of the more whimsical cards, the Page of Coins, looks like he’s puckering up and getting ready to kiss the coin in his hand. Or is it a bagel? 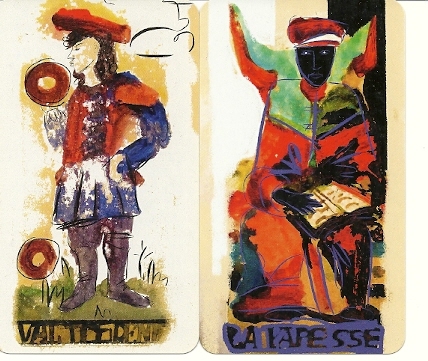 The black Papesse, one of my favorites, is colored by the deep mysteries she transmits. The trump cards do not have numbers, except Death, which is labeled XIII. In older Italian decks it’s often called “The Thirteen” (Il Tredici) to avoid using the “D” word. The Tower has one falling figure and is called La Maison Dieu. Some Batons look like the straight swords in the Visconti-Sforza deck, and some of their tips look like pens. The deck is playing card size, 4.75 x 2.75 inches, smooth and easy to shuffle. It comes shrink-wrapped and does not have a card with identifying information, so I made up an index card to keep with the deck before I forgot its vital statistics. LaPage’s website https://theluminarian.wordpress.com/ has excellent articles on reading intuitively without spread positions, profiles of court card personalities, and combining suit symbols with numbers. Well, I have to admit I didn’t understand how the name made sense in French either. Then when I first saw your explanation, I was expecting something more whimsical — with hillbillies and banjos. All in all, it’s definitely unique. Hi Rebecca – The Hillbilly Tarot – I’m surprised no one has done it yet. I’ve heard that LaPage has done several LeNormand decks, but I don’t see them on her website. Maybe she has a Hillbilly LeNormand in the works? ?